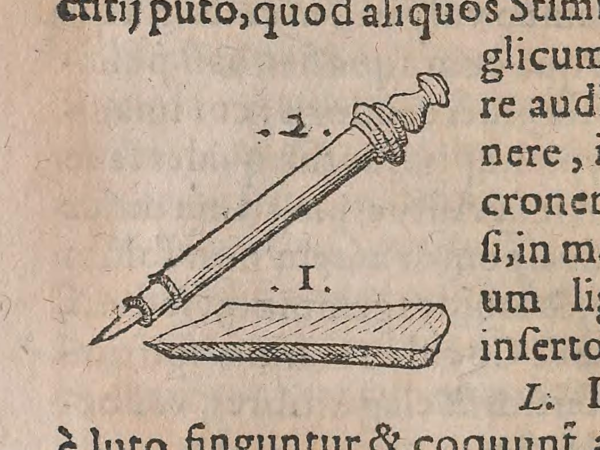 The first drawing of a pencil, found in Conrad Gessner's 1565 book on fossils. A class of fifth-graders from Green Acres Elementary in Lebanon, Ore., asked us to find out how pencil lead is made. That quest took us all the way back to the dawn of the universe and then all the way up to a factory in Jersey City, N.J. In the process, we learned that pencil lead (actually not lead at all but a mineral called graphite) has a storied past. Here's the legend: In the mid-16th century, a storm uprooted a tree in England's Lake District. Clinging to the tree's roots was a shiny black substance — graphite! We don't know how much truth there is to that story, but we do know that just a few decades later, the site had been transformed into the first commercial graphite mine. At first, local shepherds were the only ones making use of graphite — it was perfect for marking their sheep. The stuff looked and acted a lot like lead, so some called it plumbago (from the latin word for lead, plumbus) and sometimes "black lead." That name stuck. To make the graphite a bit easier to use, surveyors and artists wrapped sticks of plumbago in string or sheepskin. In 1565, Swiss naturalist Conrad Gessner published a drawing of a strip of graphite inside a tube of wood — the first depiction of a wood pencil. The invention swiftly spread through Europe. In 1794, Revolutionary France was at war with Britain and completely cut off from high-quality English graphite. The minister of war asked engineer Nicolas-Jacques Conté to find a solution. Conté ground up impure, low-quality graphite, mixed it with wet clay, shaped the mixture into rods and then baked them. The result: passable pencil lead. "Crayons Conté" (from the French craie meaning chalk) proved that continental pencil-makers no longer needed to rely on the graphite deposits of their British enemies. A version of Conté's process is still used today. Conté's innovation led to decades of experimentation. German pencil-makers tried out different proportions of clay and graphite to achieve softer and harder pencils that made darker or lighter marks. These experiments weren't confined to Europe. In America, Charles Dunbar stumbled upon a graphite deposit in New Hampshire and got into the pencil-making business with his brother-in-law, John Thoreau. John's thoughtful son David*, unemployed after graduating from college, started helping out with the family business. He developed new refining techniques that made Thoreau pencils less brittle, less greasy — at the time, they were the finest pencils America had to offer. The Thoreaus were able to offer a variety of pencils, from No. 1 (the softest) to No. 4 (the hardest). That numbering system survives today. *David later changed his name to Henry David and spent two famous years living in a cabin near Walden Pond. Since the 1960s, students in the U.S. have used, by and large, No. 2 pencils. No. 1 pencils are soft and smudge easily. No. 3 pencils are harder and therefore break more easily. No. 2 hits the sweet spot: perfect for filling in bubbles on the SAT. In 1779, scientists showed that pencil "lead" wasn't lead at all. It was made entirely of carbon. A few years later, another pure-carbon mineral was revealed: diamond. The two substances couldn't be more different. Graphite is dark and brittle. Diamond is clear and incredibly strong. How could they have the same chemical makeup? In the 1920s, the answer was revealed. In diamond, carbon atoms are stacked in a pyramid, forming tight, strong bonds. 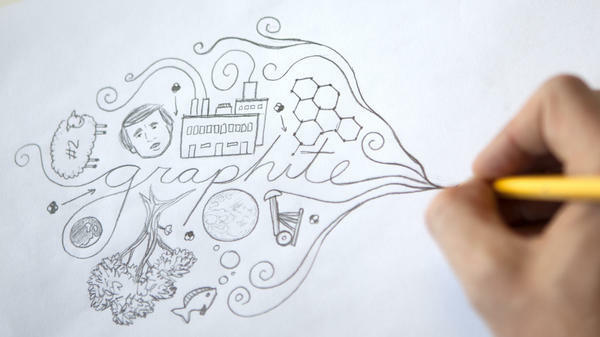 In graphite, carbon is arranged in sheets. Within these sheets, atoms form a sturdy, hexagonal lattice. But the bonds between those sheets are weak — they slide apart with ease. When you drag graphite across paper, those sheets slough off. The layer of graphite left on the paper is incredibly thin — a thousand times thinner than a human hair. That means, according to mathematician John Barrow, a single pencil could draw a line over 700 miles long. Pencils were originally painted to help mask the low quality of their wood — only the fanciest pencils went unvarnished. But at the 1889 World's Fair in Paris, an Austro-Hungarian pencil company unveiled a new luxury pencil. It was made with the finest materials and named Koh-I-Noor after the largest diamond known at that time — a diamond that would soon adorn the British crown. And this finest of pencils was painted yellow — perhaps to honor the empire's flag. The marketing strategy worked, at first. Yellow came to be associated with quality. But soon, copycats were painting their pencils yellow too. In the early days of pencils, people used balled-up lumps of old bread to erase their mistakes. But in 1770, clergyman-chemist Joseph Priestley noticed that a strange gum harvested from trees in South America was particularly good at removing pencil marks. Because some rubbing was necessary, Priestley called the stuff "rubber." Want us to answer your questions? Ask them here. And check out other answers on NPR's science-focused YouTube channel, Skunk Bear. We're now far enough into the school year that students are taking tests. And what do you need to fill in those answer bubbles - the good old No. 2 pencil. Elissa Nadworny of the NPR Ed Team visited one of the few U.S. factories that still makes pencils the old-fashioned way. And get ready because at the end of this, there will be a quiz. ELISSA NADWORNY, BYLINE: The General Pencil Company in New Jersey started making pencils in 1889. Most No. 2s are made in China, but they're still cranking them out here. To get a look at how they do it, you have to head to the basement. HELMUT BODE: So this is the dungeon where we make our graphite and charcoal cores. NADWORNY: That's Helmut Bode, who oversees the factory. He's been in the pencil industry for nearly 40 years. And did you hear what he said - graphite, not lead. Helmut wants to get one thing out of the way. Lead was never part of the pencil - well, maybe in the paint. BODE: Then when they found graphite, it kind of acted like lead, so they used the Latin word plumbago. NADWORNY: Plumbago translates as acts-like or resembles lead. Over time, the acts-like part was dropped, making people think pencils were made of lead. Down in the basement, the graphite is squeezed out into dark gray rods that look like uncooked spaghetti. Then Helmut and I follow the cores upstairs. The two pieces of wood are glued together to hold the graphite in place, and then they're cut into individual rods. They finally start to look like pencils but not quite. They're still brown. They need paint. Cue the conveyor belt. The pencils get loaded up then dipped in paint, then spit back out on the belt, which brings me to Helmut's next fact - why classroom pencils are yellow. BODE: Yellow is the traditional color to show quality because it was the most expensive and most difficult color to paint. NADWORNY: After painting, the eraser is added, then the General Pencil logo and the final stamping - a shiny No. 2. So here's my big question. Why do students always have to use No. 2? BODE: It's not too hard. It's not too soft, so you can write without having to sharpen it constantly. NADWORNY: And those test-scoring machines agree. SHAPIRO: That's NPR's Elissa Nadworny. And as we promised, she is now here in the studio with a pencil quiz. Hi, Elissa. NADWORNY: True or false - a pencil can write underwater. SHAPIRO: I cannot imagine a pencil writing underwater. I'm going to say false. NADWORNY: Yes, pencils can write underwater. NADWORNY: Helmut, my pencil guy in New Jersey - he goes sailing and he uses this pencil to, like, mark up whatever's wrong with the boat or if he sees something underwater. NADWORNY: Before erasers were made out of rubber, what food product was used? A is stale bread, B - marshmallows. C is dried apricots. SHAPIRO: I'm going to guess that before erasers were invented, the only one of those three that was actually around was stale bread. NADWORNY: And you are so, right, yes. NADWORNY: Yeah. It wasn't till the 1700s that they used gum from trees. NADWORNY: OK, so question number three - before people started using graphite for writing, it was used, A, as an early form of eyeliner; B, by shepherds to mark their sheep or C, a spice that added flavor to coffee or tea. SHAPIRO: I don't think it was a spice because people still use pencils for eyeliner. I'm going to say eyeliner. NADWORNY: And you would be wrong. It's B. Shepherds used it to mark their sheep. SHAPIRO: Wow, OK, well, NPR's Elissa Nadworny of the NPR Ed Team, thanks for the info on pencils. NADWORNY: You're welcome, Ari. Transcript provided by NPR, Copyright NPR.